The DuPage River is a small-to-medium sized stream flowing north to south through DuPage and Will counties and ending at its confluence with the Des Plaines River in Channahon. The DuPage consists of east and west branches which meet south of Naperville. Together, they make up eighty-four miles of waterway that drain a watershed of 326 square miles. The East Branch is largely channelized, and the West Branch is mostly natural and meandering. Scenery along its East and West branches is mostly suburban with low grassy banks, while the DuPage mainstem is mostly rural. 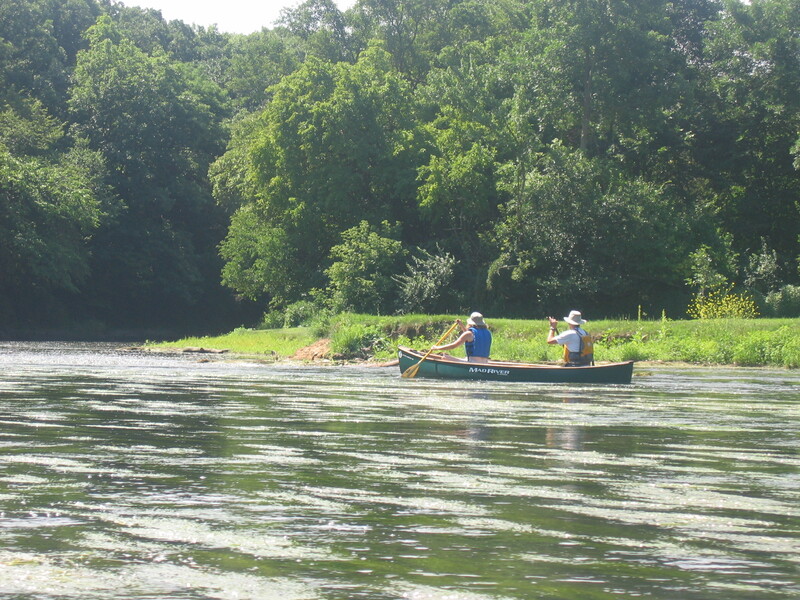 The lower part of the West Branch has several developed canoe launch sites. However, both branches are shallow in their upper stretches and occasionally difficult to paddle due to low water in the summer months. The upper stretches of both branches run through residential neighborhoods. The upper East Branch resembles a channelized drainage ditch more than a potential recreational resource. Therefore, the upper sections of both branches are not recommended as water trails. West Branch—Beginning at West Branch Forest Preserve, near Carol Stream, the West Branch flows through a number of DuPage County Forest Preserves. The Forest Preserve District is developing a greenway along its banks to protect the river from development and to provide a peaceful, wildlife-rich experience for paddlers. Log jams across this narrow stream and shallow stretches are occasional obstacles. Lions Park on Beecher Road in Winfield is the first developed canoe launch. It is followed downstream by five more developed launch sites before the DuPage’s confluence with the East Branch. East Branch—The usually canoeable part of the East Branch begins south of Warrenville Road in Lisle. A narrow stream through most of its length, the river flows through a city park in Lisle and Greene Valley Forest Preserve between Woodridge and Naperville. There are currently two developed launch sites on the East Branch, one at DuPage River Greenway and one at Hidden Lakes Historic Trout Farm. An access at Lisle Community Park is proposed. DuPage River Mainstem—The confluence of the two branches is approximately 0.5 miles downstream of the public landing in Knoch Knolls Park on the south side of Naperville. There are several access points on the mainstem, beginning with the Will County Forest Preserve’s Riverview Farmstead (111th Street). Plainfield Park District has created two access points downstream at Eaton Preserve (135th Street) and Riverside Parkway (just south of Caton Farm Road). Hammel Woods Forest Preserve in Shorewood provides an access site at the dam on the north side of Route 52. Downstream, a short section (approximately 0.5 miles) located between I-80 and Shepley Road, west of Channahon, has a gradient of 10 feet per mile, which at higher water levels creates an exciting set of rapids for white water enthusiasts! 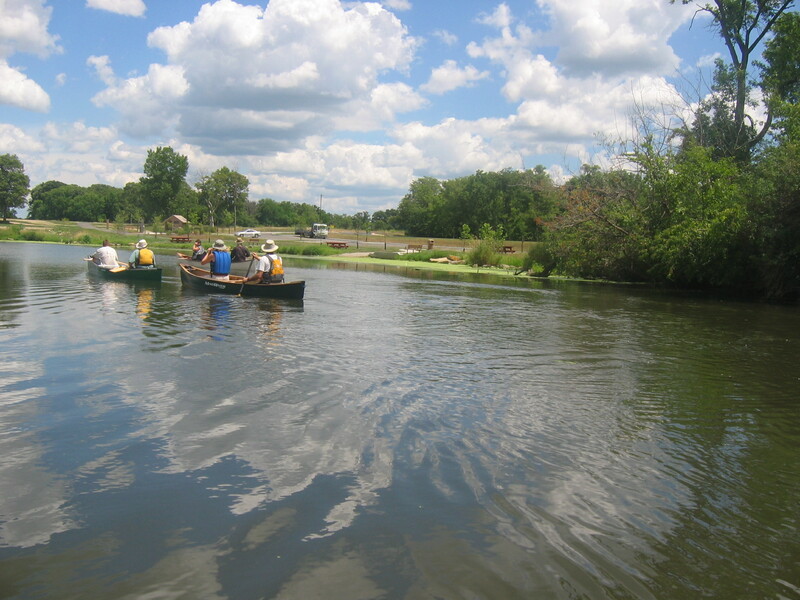 The villages of Channahon and Minooka have recently installed a canoe launch at McEvilly Road. Note: There is a dam at Channahon, and a portage around the dam is on river left. Downstream of the dam, just before the confluence of the DuPage and Des Plaines Rivers, the Forest Preserve District of Will County has created a launch at McKinley Woods–Kerry Sheridan Grove. We give a special thanks to paddler Allie Mouche who assisted Openlands by reporting conditions along the DuPage River as we prepared this guide. Directions: This stretch can be divided into three sections, each one safe and easy for those with some paddling experience. The first section lies between Lions Park on Beecher Avenue in Winfield, only two blocks west of Winfield Road, and Blackwell Forest Preserve canoe launch, on the south side of Mack Road, approximately 0.2 miles east of Route 59, in Warrenville. This shallow, quiet water trail flows through Blackwell and West DuPage Woods Forest Preserves. The second section continues another two miles from the Blackwell Forest Preserve canoe launch, at Mack Road, to Warrenville Grove Forest Preserve, in Warrenville. The third section, another two mile stretch, runs between Warrenville Grove Forest Preserve and McDowell Grove Forest Preserve, which is located on the east side of Raymond Drive, approximately 0.3 miles south of Diehl Road, in Naperville. Notes: Please respect the privacy of riparian landowners and don’t land on private property. Paddlers are advised to avoid this water trail during periods of extreme low water levels. Directions: McDowell Grove Forest Preserve is located on the east side of Raymond Road, at McDowell Avenue, in Naperville, just south of I-88. The take-out at Knoch Knolls Park is located on Knoch Knolls Road in Naperville, one mile west of Washington Street amd near the confluence of the two branches of the DuPage River. Notes: The first half of this trip include the Fawell Dam (portage is on the right), as well as the popular downtown Naperville Riverwalk and its covered bridges. 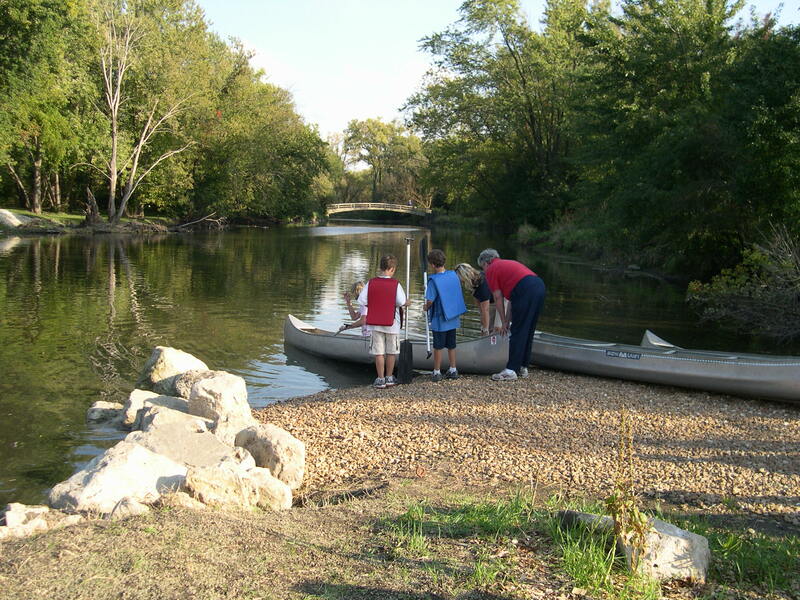 Naperville Kayak offers rentals and lessons on the DuPage River and on the downtown Naperville Quarry. Some sections of the river here are filled with riffles and will be too shallow to paddle during the driest times of the year. But put-in just after a moderate rain and you’re in for a pleasant trip because this stretch is very scenic, even in the heavily settled areas of Naperville. The second half of the trip is mostly secluded, but very shallow. Check your water levels before canoeing. Directions: Take I-55 to Weber Road. Exit north to Naperville Road (left), cross the river and turn left at Ring Road, left again at Knoch Knolls Road, and go less than a mile to the park entrance and the canoe launch. Eaton Preserve is located at 135th Street (Pilchen Road) and just west of Route 59, in Plainfield. Notes: This trip was made possible in 2003 when the Plainfield Park District completed the public access at 135th Street. This scenic trip is a popular destination for great blue herons, feeding and relaxing from their nesting activities at nearby Lake Renwick. Directions: Eaton Preserve is located at the intersection of 135th Street and the DuPage River, near the northern edge of Plainfield. Riverside Parkway boasts the only canoe launch sign visible from busy I-55. Get there by exiting the interstate at Route 30 (west) and following the frontage road south across Caton Farm Road. 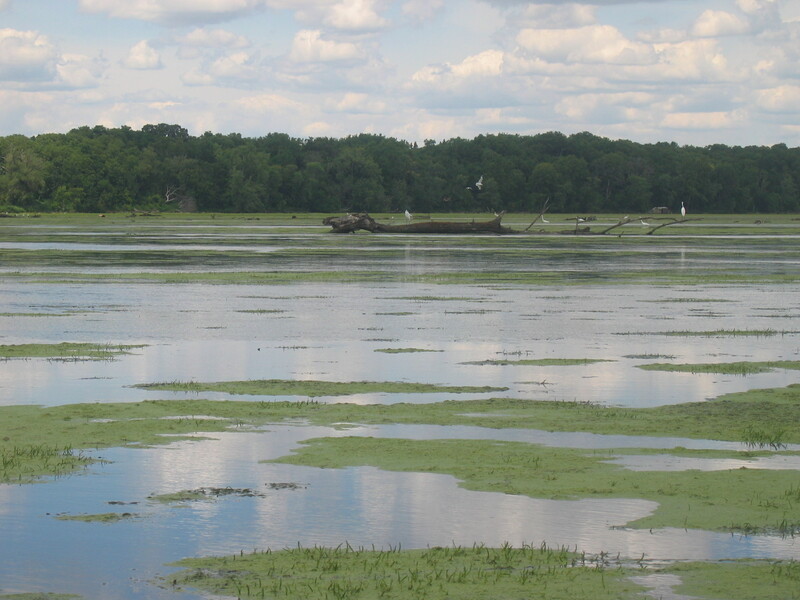 Continue alongside I-55 until you reach the right turn into the park and canoe launch area. Notes: This trip through Plainfield passes within a few hundred yards of the Lake Renwick Heron Rookery. The high concentration of birds on this stretch of the river will please avid birders and paddlers alike. Directions: Riverside Parkway is located west of the I-55 frontage road, just south of Caton Farm Road. Exit the interstate at Route 30 west, and follow the frontage road south, along the highway. Channahon State Park access to the I&M Canal is located just south of Bridge Street and just below the large dam where the canal and the river join. Take either the Route 6 west exit or Bluff Road west exit from I-55, and turn left onto Canal Street, then right onto Bridge Street. Notes: A favorite of early-season thrill-seekers, this stretch produces Class II rapids after a good rain. Many whitewater beginners practice surfing in the standing waves near Shepley Road. 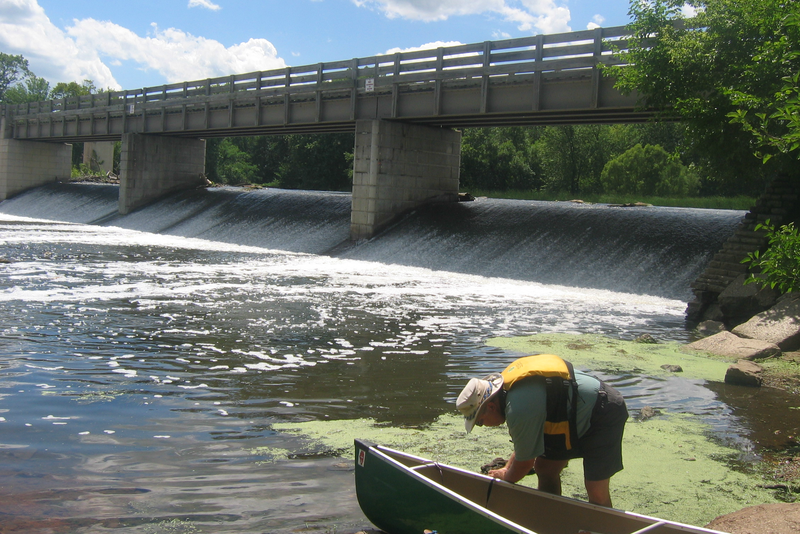 There are two dams to portage on this trip, and the take-out is awkward, but this is some of the best intermediate paddling northeastern Illinois and the surrounding region has to offer. Directions: This short trip follows the DuPage River Greenway Trail, in Bolingbrook. The put-in is just south of Royce Road, west of Route 53. The take-out, at Hidden Lakes Historic Trout Farm, is approximately 0.3 miles north of Boughton Road, one mile west of Route 53. Notes: Improved by the Bolingbrook Park District, this stretch offers a scenic float trip for families with young children. The trail still has a few low-hanging branches to avoid, and the take-out “sneaks up” on the left, just before a pedestrian bridge over the river. Beyond the bridge and below the take-out area are several obstacles, including a large pipe across the river, making the downstream section of trail difficult and potentially unsafe for use by novice paddlers. The gage, at least at warrenville, seems to be highly inaccurate. Had no problem paddling that section when it read 5 feet, another weekend it read over 7ft and we were pushing our boats every couple of minutes. 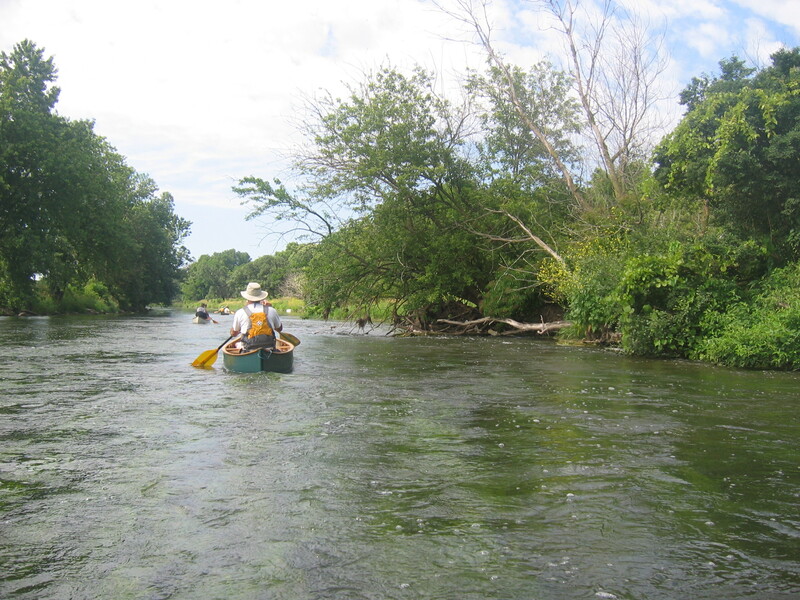 I was recently told by a Fox River guide that there is little to no traffic on the Dupage after July 4th because it is largely impassable with exception of significant rainfalls. Also one riverfront resident between Mack Road and McDowell is apparently attempting to dam the river for aesthetics. Any vessel will impact. There is a large white gazebo and bench swing if I recall, kitschy stuff in their back yard. Will geotag and report next time on the river. Thank you, Michael, for reporting your trip where you found the water levels too low for paddling! The USGS stream gage for September 2 at West Branch DuPage River near Naperville (USGS 05540130) showed a gage height of about five feet and stream discharge of about 50 cubic feet per second. Paddlers considering the stretch between downtown Naperville and Pioneer Park who check the gage can look at currrent stream height and discharge and compare them to the levels that you found too low. I paddled a section of the river with the Dupage Forest Preserve and now want to do both branches and down to the end. This is a great resource!